Just last night some of us from the work social club were at a bit of a party and we were discussing (among hundreds of other things) the ructions that the local civil defence organisation has been going through (basically it's been taken over by the Regional Council - i.e. the old Catchment Board - and anyone who actually had any local knowledge has been got rid of fairly quickly). It was mentioned that there would be problems if there was ever an actual civil defence emergency down here. 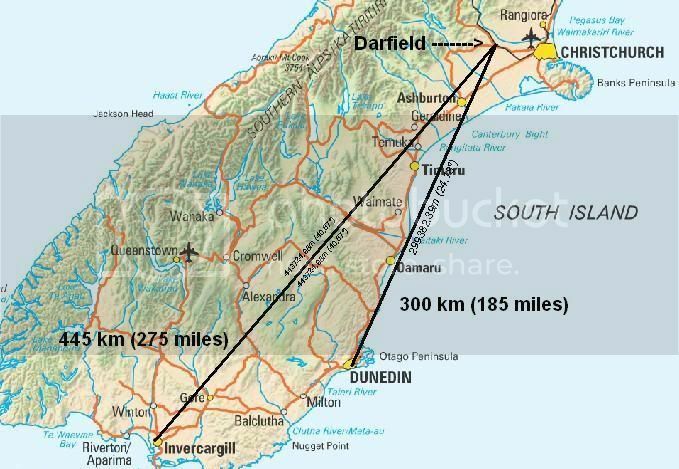 This morning I wake up to the news that Christchurch - the biggest city on this island (and the place where I was born, which is why I can never qualify as a Real Southlander) got hit by The Big One at about half four in the morning. Apparently it was felt down here, but it wasn't big enough to wake me up. There's a time line of events here: http://www.stuff.co.nz/national/4096345/Quake-timeline (and the site has links to other news articles - despite the nondescript domain name it's the local newspaper's main web site). I'm still here. It's a long way away from me (see map below) and, while there is widespread property damage in Christchurch and surrounding areas (including the epicentre, Darfield; and Lyttelton, described in the newspaper timeline as a "historic harbour town" but probably better known internationally as the place where the Michael J. Fox film "The Frighteners" was filmed), I haven't seen any reports of damage in Otago or Southland; and even in Christchurch so far there have been no deaths and two serious injuries. Power and water/wastewater are apparently very dodgy throughout the city (the most worrying damage is to the city's sewerage lines; already people are being told to keep away from the Avon and the Heathcote rivers) but there still seems to be some backups operating as telecommunications (which run in a long thin pipe the lenth of the country) and my internet provider (which is based in Christchurch) still seem to be working. Ack! Glad to read you are all right! Scary stuff! I'm glad to see you checking in safely. Yeah... We've had a string of earthquakes over the last seven years or so, but this particular one has been the most destructive earthquake in the country since 1931 (more because of where it was rather than how big it was - this one was centred within cooee of the biggest city on the island, whereas the big ones I've felt locally were centred on the far side of Fiordland where there are practically no permanent inhabitants). It's amazing that there aren't thought to be any deaths directly caused by the earthquake or its after-effects... the closest I've seen to such is a report of a heart attack shortly after the earthquake. Some people are thanking their favourite deities for this; me being me, I'm thanking the building code.